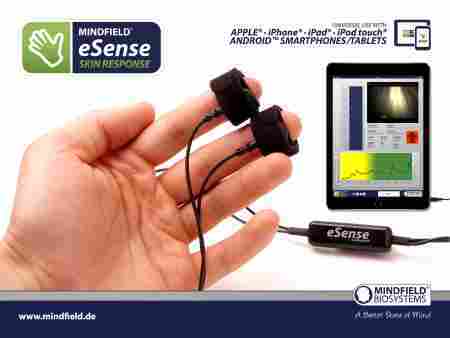 Gronau, Gronau – September 12, 2018 – Mindfield Biosystems announces eSense Skin Response and eSense Temperature, the latest biofeedback sensors for smartphones and tablets. Both of them determine the acute stress level – the skin response by measuring the skin conductivity and the temperature by measuring the skin temperature. The collected data is then analyzed and visualized by means of a cost-free app. Negative values trigger an immediate Biofeedback response. A necessary relaxation session can therefore be initiated in a targeted manner. For the first time, biofeedback sensors draw power from the mobile device, making them very easy to use. Another new feature is the connection of Philips Hue mood lights and smart bulbs for additional stress level visualization. The Mindfield eSense App will also graphically process the recorded measured values – bar graph and oscilloscope – for a quick classification. As an immediate feedback on an increased stress load, an indication is given via vibration, sound or music. You can also play a video that stops automatically if the value is negative. Besides the measurement history in diagram form and the comparison of individual measurements, all data can be transferred via e-mail in Dropbox or Google Drive.